Some of you might remember an old production called "The Music Man," about a con artist who sweeps into a small, hapless town to fleece the place. Well, similar stories occasionally take place in real life, too, except without Robert Preston and all the singing. When it's happened at a community level in Montana the favorite target has probably been Butte, that most hapless of places ... but I think this year's prize for being duped will undoubtedly go to the little town of Hardin. A few years ago, some Texas promoters showed up in Hardin and told them that their economic woes would be over if they just built themselves a prison ... and so the town did, but nobody bothered to figure out where to find inmates for the place. So the prison sits empty, the construction bonds are in default, and the Texans have gone home. And now another Harold Hill has shown up in town, the head of a mysterious company called "American Police Force" that has promised to open the prison, pour millions into the town, and be Hardin's savior in a hundred other ways. The company has a ludicrous website but no paper trail, and now it turns out that its president has a long history of fraud convictions and personal bankruptcies. But Hardin still has faith. It's going to be fun watching all this play out, and it's going to be a heck of a story ... it's too bad Hunter S. Thompson isn't still alive to write it. 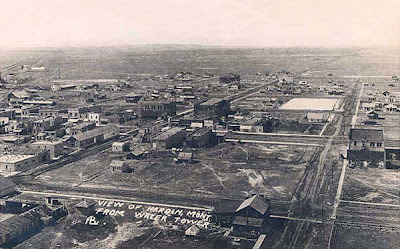 Anyhow, I haven't taken a current photo of Hardin for you, so here's an historic image of the place. This probably dates from about 1920 or so. What a story...the comments on one site are enough to generate a big dose of paranoic speculation...Blackwater...militia...Serbia...Medical Marijuana research...Quazi Products...Iranian...poor Hardin. Ameircan Police Force indeed. It's something, isn't it??? In a way, you have to feel sorry for Hardin -- it's a town that's lost a lot, and doesn't have much going for it -- but at the same time you have to wonder how anyone in a position of authority could possibly buy into all that nonsense. It's gonna be a mess, and it's going to end badly for a number of innocent people ... but as I said, it's also a heck of a story!